RLS- Sciences seeks to leverage the unique composition and strengths of the RLS network to support scientific research within and between the RLS regions. We work to generate and support academic, scientific and technological exchanges, and the initiation of multilateral research projects. 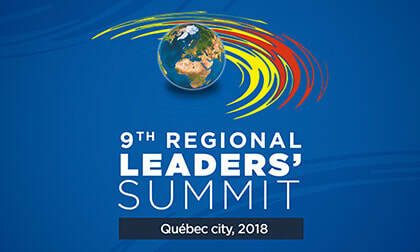 From 16 to 18 May, 2018, the Regional Leaders Summit was held in Québec. This marked the ninth meeting of the Regional Leaders Summit, and the theme was ''Energy Transition: Towards a Low-Carbon Economy''. Surrounding and embedded within the 9th Regional Leaders Summit were a number of scientific activities, including the inaugural RLS-Energy Network Summer School, a Digitization Day hosted by FRQNT, the second Global Aerospace Campus Summer Summit, a Small Satellites project meeting, and a multilateral research project presentation to the RLS heads of government. Read more about the 2018 RLS-Sciences activities here and learn more about the 9th RLS here. The Regional Leaders Summit (RLS) is a forum comprising seven regional governments: Bavaria (Germany), Georgia (USA), Québec (Canada), São Paulo (Brazil), Shandong (China), Upper Austria (Austria), and Western Cape (South Africa). Within the framework of RLS, RLS-Sciences seeks to leverage the unique composition and strengths of the RLS network to support scientific research within and between the RLS regions. The goal is to generate and support academic, scientific, and technological exchanges, as well as the initiation of multilateral research projects. RLS-Sciences is comprised of its scientific network, the existing bilateral relationships between the RLS members, and its four research projects: RLS-Energy Network (the RLS-Sciences pilot project), the RLS-Expert Dialogue on Digitization, the RLS-Global Aerospace Campus, and RLS-Small Satellites. Global Aerospace Campus held its second annual Global Aerospace Summer Summit this year just outside of Montréal. The two day summit, hosted by AÉROÉTS from 10 to 11 May, featured researchers and experts from the entire Global Aerospace Campus network, as well as student participants from across the RLS regions. Review the programme here, and review a presentation on the project presented during the 9th RLS here. Learn more about the project by visiting the Global Aerospace Campus site here or watching the project video here. The RLS-Energy Network was presented to the heads of government during the 9th RLS in Québec as part of the programming of the political conference. Also in the frame of the conference, the Energy Network held a workshop with external Québec organizations. The presentations are available for review here. The RLS-Energy Network also held its inaugural international summer school on renewable energy from May 9 to 18, 2018, in Shawinigan and Québec City, jointly organized by the RLS-Energy Network, the Fonds de recherche du Québec – Nature et technologies (FRQNT) and the Université du Québec à Trois-Rivières (UQTR). Learn more about the RLS-Energy Network here. The RLS-Small Satellites group hosted a project meeting in Québec on 17 May, 2018 as part of the 9th Regional Leaders Summit. The meeting offered the partners opportunities to exchange on the developments in the past months, as well as to discuss the next steps for the small satellites ahead of the launch. Presentations from the meeting can be reviewed here (Bavaria) and here (Shandong), and the presentation to the 9th RLS can be reviewed here. To review the detailed publication references of the presentation, please go here. To learn more about the project, please visit the RLS-Small Satellites website here. On 16 May, 2018, the RLS-Expert Dialogue on Digitization had a ''Journée de recherche'' or ''Digitization Day''. The event was hosted by Fonds de recherche du Québec- Nature et technologies (FRQNT) in Québec. The day involved exchanges between researchers and representatives from across the RLS regions, as well presentations from Québec industry participants. Read more about the event here, or review a presentation on digitization in RLS presented at the 9th RLS here. You can learn more about the Digitalization Dialogue here.